41st Edition : April 2017. Weak demand from both Indonesia and Vietnam must soon start to put serious downward pressure on northern Australian feeder prices. Spanish beef is being sold at discounts even lower than Indian buffalo as product expiry dates approach. Philippines live cattle prices take an unexpected 10% leap. The actual price of steers has weakened from an average of Rp41,000 per kg live weight last month to Rp40,000 in April. The bad news continues for lot feeders with both demand and prices weak. Discounts of as low as Rp39,000 per kg have been reported for some distressed sales and there is no sign of relief from any direction. Following a Ministerial direction, Police are regularly visiting feedlots to check on numbers and prices of cattle sold with orders from above to take action against any importers who are found to be putting their prices up. At the moment this appears to be a waste of Police time and resources as prices are falling of their own accord as a result of the buffalo beef competition killing off demand for live slaughter cattle. Even in the newly opened feeder cattle market of East Java, prices are stuck at Rp39,000. When I asked industry players why the price is weak despite the market being only recently re-opened as a result of high prices and short supply, the answer was “imports” of Indian beef. This introduces yet another new angle in this saga as there are those who suggest that Indian buffalo is now being illegally imported as well as being legally introduced through BULOG. The argument suggests that because East Java has officially blocked the import of Indian beef (in order to protect their local farmers) that it is now being illegally smuggled outside the official BULOG import process. The source said that because Indian product can now be “legally” and openly marketed, that smuggling of additional product outside the government’s own import mechanism represents an attractive proposition and an acceptable risk to entrepreneurial actors who can see a lucrative opportunity. With importers battling to sell their stock, even at discounted prices, the last thing they wanted to hear was the government insisting that they fulfil their import permit quotas. Some months ago, all importers applied for their new permit allocations and were generally granted whatever they asked for since they all agreed to bring in a certain number of breeders according to the set formula. Now that sales have slowed right down, some importers are delaying or cancelling planned future orders as they are genuinely concerned that they are likely to generate losses from future shipments. In response to this slow down in import numbers, the government has advised importers that if they fail to bring in less than 80% of their permit numbers then severe sanctions may result. 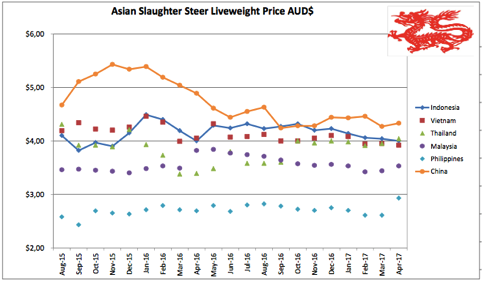 Prices of feeder cattle in Australia remain stubbornly high so the outlook for Indonesian importers just gets worse by the minute. And most haven’t started importing breeders yet which will only add to their misery. During April I was informed that despite the fact that there were large volumes of Indian buffalo beef remaining in West Java cold storage, that some retail outlets in certain wet markets had been unable to source supplies for up to one month. I was not able discover the specific problems but it appears there may be some disagreement over the strict marketing rules prescribed by the government which may be being disputed by some wet market players. Last month I reported that supermarkets were being encouraged by the government to offer buffalo beef in their major outlets. I took the photo below in the large Carrefour outlet in Bali during April. In March, buffalo beef filled this chest freezer. The offering now is down to one small row within the same freezer. Photo : The Buffalo beef offering has now shrunk from the whole freezer to one shelf in Carrefour, Bali. Towards the end of the month I received a report that Spanish beef was being heavily discounted to the point where it was selling significantly below the price of Indian product. This was causing further grief for some fresh meat traders who were being hammered by both Indian competition and now super discounts on Spanish product. The only explanation that I received was that the Spanish product had an expiry date and this was fast approaching causing the sellers to drop their rates to ensure that their entire inventory was sold before the expiry date was reached. 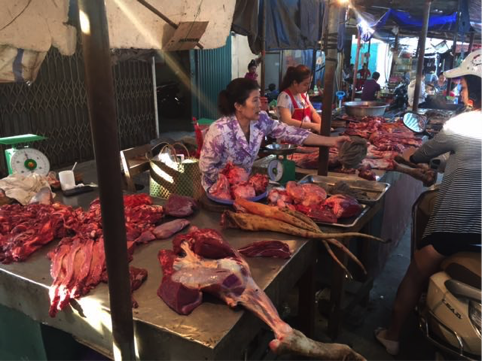 When this information relating to very weak slaughter cattle demand is combined with a similar situation developing in Vietnam (see below) it seems likely that there will be a great deal of downward pressure on northern cattle prices in the very near future. As the dry season opens in northern Australia and feeders hit the market in numbers, producers will only have southern markets available to sustain their current high rates. While I am not familiar with the southern Australian market, it seems logical that if southern buyers discover that there is only very weak live export competition for feeders in northern Australia then they will most likely back off on the rates they offer until a new lower level is found where both Asian and southern market competition returns to equilibrium again. Considering the very weak situation in both Indonesia and Vietnam at the moment with what looks like only more downside to come, this correction in northern prices may well be sharp and significant. The only good news I can find is that it is a great season in Indonesia generally and Bali in particular with the wet season stretching out into the usual dry(er) period. The rice fields look great and are almost ready for harvest while the cattle are fat and productive. 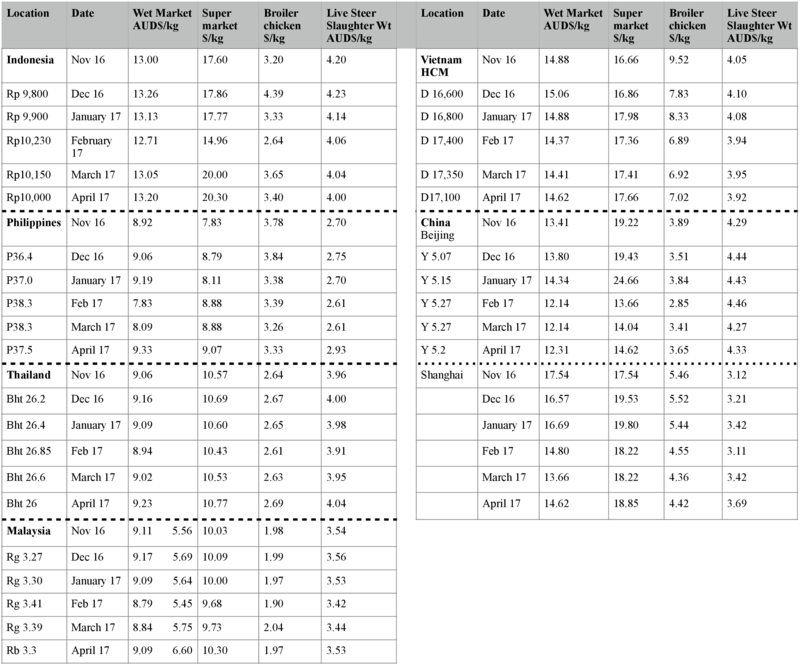 Good seasons drive lower commodity prices for lot feeders. 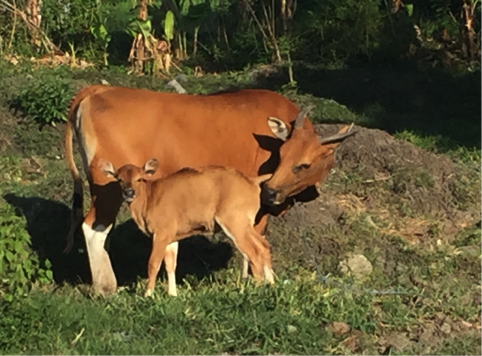 Photo : everywhere you go in Bali, the cows and calves are fat and shiny. Prices here are stagnant as consumer demand for high priced beef remains weak. My agent reports that the market is “slow like a turtle” and that abattoirs are “fed up” with high prices. High prices are only available for animals with very low levels of fat such as heavy bulls. The best bulls ( in the north were prices are higher) can achieve Dong76,000 per kg live weight while any animals with poor carcass composition are penalised heavily. Lean steers can attract D73k while fat steers can expect as low as D69k. Slaughter heifers will receive D68k at best. In the south, lean steers are selling for around D66-68,000 per kg live weight. One of the original importers to develop a number of very large feedlots has suffered from poor performance with their business declining and numbers now down to a few thousand where at one time they may have had an inventory of up to 50,000 head. As a result of the Thai government cracking down on the use of illegal Beta Agonists (which dramatically reduce the proportion of fat on a carcass) the fat percentage of imported Thai cattle has increased to the point where abattoirs are refusing to pay the premium these cattle used to attract in the past. These live cattle supplies have recently been replaced by the very small Cambodian and local Vietnamese cattle which were already in low numbers and are therefore now even harder to find. Photo : see the size of the small local cattle. This leg will be from a fully-grown animal. And the Vietnamese have strong supplies of good quality pork to fall back on with prices at around half that of beef. 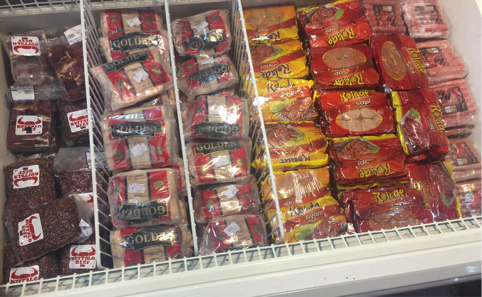 Photo : alternatives for beef include domestic pork, wild pig (above top) and wild venison (above bottom with skin on). The general story here is the same as in Indonesia. Importers are finding it either extremely difficult or impossible to make a profit from the importation of live cattle from Australia (or anywhere else). Like most businesses they have battled on hoping that this was just a short-term situation that would soon resolve. Unfortunately, there has been no new solution to their problems so it is likely that there will be a continuing reduction in demand from both Vietnam and Indonesia. In the past, when one of these customers had backed off there was almost always scope for the other to take up some of the slack allowing demand and therefore northern Australian prices to hold up. With both key markets in extremely difficult financial positions, I see no alternative but for a significant weakening in demand from both and therefore in northern prices. Prices remain stable with domestic demand steady. Lower import numbers from Myanmar are being offset by reduced exports to Vietnam. The government testing of all feedlots to check for illegal Beta Agonists appears to have slowed the flow of animals exported to Vietnam. Some of the illegal beta agonists are remarkably affective at increasing the proportion of muscle to fat in the carcass. These very high low fat dressing rates have allowed Thai cattle to attract a premium from the Vietnamese butchers but, with this advantage now gone, Vietnamese abattoirs have now switched to killing very lean local cattle to keep their customers supplied. The only thing of interest to report from Malaysia (once again) is the continuing climb in the price of Indian buffalo. My indicator price is for frozen knuckle sold in the wet market. This month it has increased once again over the previous month (AUD$5.75) to RM6.60 and none of that change is due to a weakening currency, in fact, the Malaysian currency is actually a little stronger this month against the AUD. Prices here are on the move for beef as well as other commodities. Live cattle prices have had their first big jump for a very long time with slaughter steer prices jumping 10% this month. Wet and supermarket prices for beef are also up while pork is currently retailing at its all time highest rate. My agent is not exactly sure about the reasons for these rises but is happy to report that demand continues strongly despite prices of almost everything going up. Seasonal conditions have also been very favourable with farmers achieving excellent harvests. This month’s slight increase in the slaughter rate is only due to the currency variations as the indicator price comes from Beijing. The story is different in Shanghai where the rate has increased for the third straight month (Y16.4, Y18 and Y19.2 this month). Wet and Supermarket prices have also increased a little in both Shanghai and Beijing. Winter has always been the traditional time when beef consumption and prices go up so I have no explanation for these rises as summer approaches. Hopefully they are a true indication of supplies tightening which may help bring the exports of Australian live cattle that bit closer. 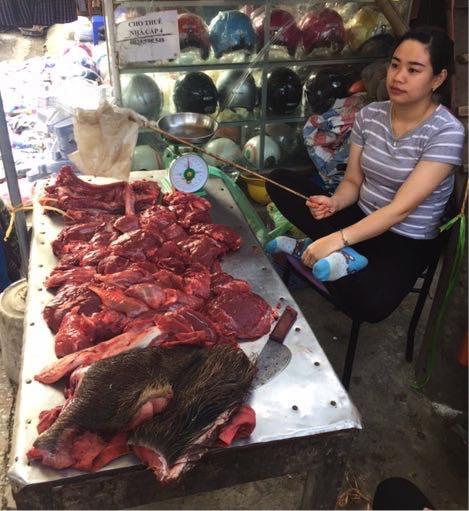 My sister was recently in Argentina where too much beef is never enough. 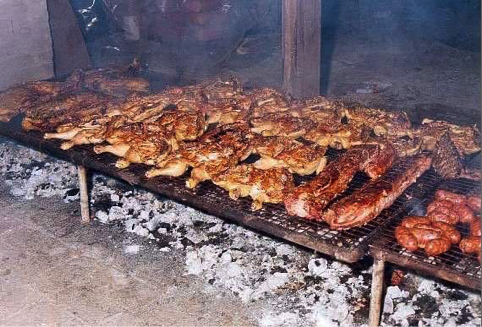 Photo : an “Asado” is the name for an Argentine BBQ where meat is cooked over the coals on a grill called a “parrilla”. It’s not just a way of cooking, it is an art form.